Having a family reunion? You\'ll need all the space you can get. With the Greenwood you\'ll be prepared. Slick stainless steel exterior for a crisp clean look! 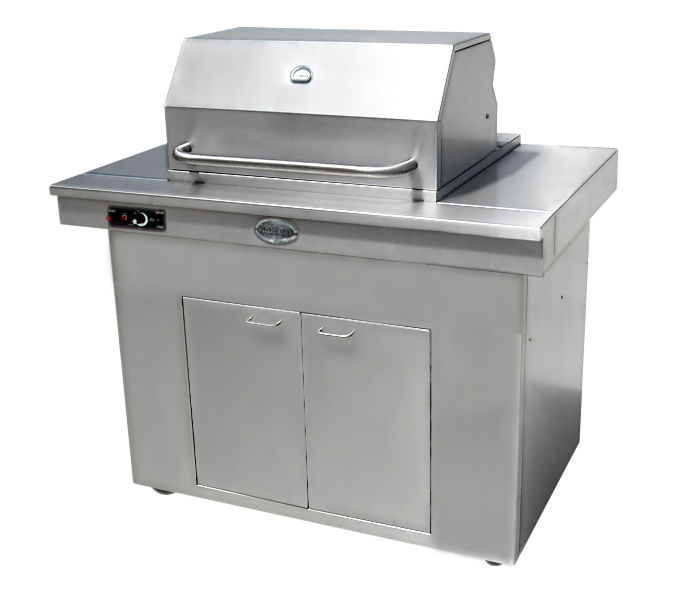 Height: 48" Width: 47" Depth: 35"
Why Buy A Louisiana Grill Barbecue? THE TASTE IS WHY PEOPLE BUY. If you are like most people, you crave that REAL WOOD FIRED FLAVOR that Lousiana Grills barbecues offer. Our flavored pellets draw out the flavor, making your meal all the more succulent and savory. IT\'S EASY TO WORK WITH! Our high efficiency auto-igniter eliminates the need for fire gels and starter fluids. Anyone in the family can fire up the grill with the push of a button! NOW WE\'RE COOKING! (CONVECTION COOKING) Because the air is forced by combustion fan, you can achieve convective cooking with your Louisiana Grill. This eliminates the need for a rotisserie, gives more even cooking temperatures and allows your meat to retain its natural juices. CRAFTSMANSHIP COUNTS. Our heavy duty construction, manufactured from 12-20 gauge stainless and aluminized steel, will make you see the difference between our top of the line barbecue grills versus the low end models available at such department stores as Walmart, Costco, Zellers and many more. IT\'S THE CHOICE OF PROFESSIONAL BBQ\'ers! Our smallest grills can cook a 20 pound turkey to perfection... Professional chefs from all across the US and Canada enjoy the overall robustness, quality and cooking ability of our grills! WHY JUST \'GRILL\'? With a Louisiana Grill, you can SEAR, BAKE, BARBECUE, SMOKE, ROAST AND GRILL your foods with amazing results. FUEL in mesquite,hickory, alder and apple flavors.